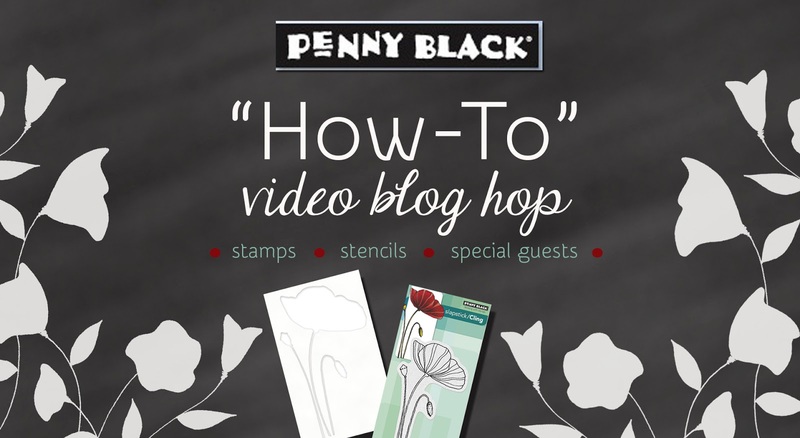 Today I'm joining a group of mixed media stampers for a Penny Black How-To Video Blog Hop! By now you've surely seen their new line of products, including gorgeous Large-Scale Stamps and Coordinating Stencils. I received a collection of these to work with, and I loooooooove them... large florals are my favorite images to work with, and the addition of the stencils creates some really fun combinations and possibilities for cards, canvases, and other mixed media work. Because the stencils can be reversed, the mirror imaging is really easy. You can watch the video to see my process. Here's a close-up on the poppy so you can see the shading better - I love how creamy the Versamagic chalk inks are when they blend. The pencils I used are Albrecht Durer Watercolor Pencils. I used a sentiment from a lovely new clear set called Kind Words. Want a collection of stamps and stencils for your very own?? To enter, leave a comment on each stop along the hop, including the Penny Black blog before Saturday, March 29 (11:59 PM PST). 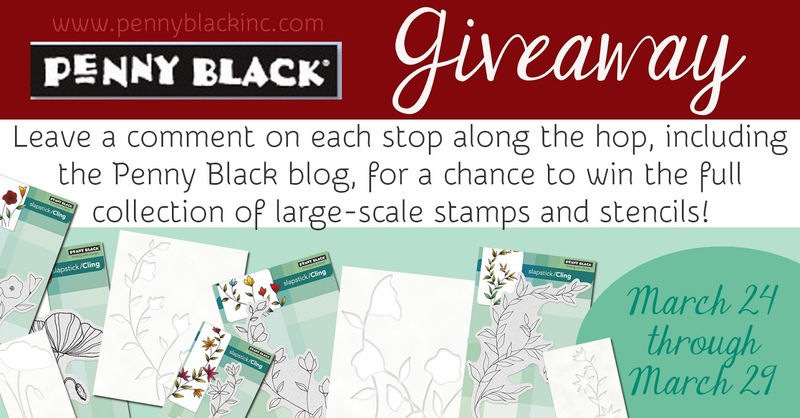 One lucky winner will receive the full collection of 5 Large-Scale Stamps and 4 Coordinating Stencils. For an extra entry, “like” and comment on the Penny Black Facebook page. Dina Kowal: http://mamadinis.blogspot.com/- - - - - - - - - that's ME!! Absolutely beautiful! The combination of chalk ink with the Albrecht Durer pencils (and your hands) really make the poppies come to life. Love the reverse technique, as well. Beautiful card and I love how versatile the stamps and stencils are together. Lovely card ! I am a fan of water-colored cards...and the technique you have shared today is awesome,loved watching the video,Thanks ! This is a STUNNING piece of art, LOVE IT! Fabulous card - love the tutorial. Cool idea having stamps and matching stencils. Dina, I love the look of the reflection! So unique! I found myself looking at it for a long time! Just beautiful! Gorgeous card . I really love the technique. Thank you for the inspiration ! Oh wow, this is such a stunning card! An absolute work of art! Dina your card is absolutely gorgeous. Thank you for sharing this fantastic technique. Absolutely stunning and a great video tutorial too! Beautiful card! Love the technique. Thanks for the inspiration!!! make it seem so effortless (which I know isn't the case)! Thank you so much for sharing. I love your use of color and thanks for showing me this reflection tutorial. Thanks for a chance to enter. This is a definite must try technique. Great Technique. A very pretty card. Wow! this card is a work of art! beautiful. This stamp and stencil is the perfect one for your gorgeous watercolor technique, Dina! Thank you for a great video. I have used every adjective I know for all these hops and yours is no exception! Wow, you are truly talented. Beautiful. Love it. You make it look simple. I have not seen this kind of effect before and it is just gorgeous! Absolutely gorgeous!!! Love the large image and love the technique. I'm wondering if you can do this with pencils? Oh Dina! This is stunning! Gorgeous color! I LOVE the ease of coloring the reflection using the stencil! A beautiful card. Liked the technique. WOW are ever a talented artist I am blown away with what you created. I watched in awe as you created I truly was mesmerized during your whole video. I am blown away by what you did with the stencils & chalk inks. Wow what a beautiful piece. What a giveaway and I already feel like a winner because of this amazing hop just filled with so much talent. That is gorgeous and you make it look so easy that I'll just have to try it. Great stamps and stencils. Thanks for a chance to win. Your card has such wow factor, I just love it! What a beautiful card! I love the reflective technique you used - very creative. Thanks for sharing! This card is absolutely fabulous!!! I wish I was that talented! Love the BIG stamps/stencils! Learned much from your watercoloring video. Thanks! You make it look so easy. Picked up many tips. Thank you. Amazing! Love this reflecting technique. Thank you for the very clear "how to". The card is beautiful .. I can't stop looking at it. Thanks a lot Dina for this amazing card. I loved the technique of teh reflection. Simply gorgeous. Interesting technique, thands for sharing. What a beautiful card - i loved the reflection and shading. Thanks for sharing this technique! thanks Dina - what a lovely card - I love your style and appreciate you taking the time to share your tips. Wow, that is just stunning! I love the reflection effect. Absolutely stunning card! Love the reflection. I can't wait to try this technique. I just love the flower reflection. Beautiful! A beautiful result with this technique of reflection! Love it! That's so beautiful, love this card !!!! Oh, my goodness - this is stunning! What a beautiful card, Dina! I love your technique - amazing work! This is just incredibly beautiful. It should be framed & hung on the wall as art! Which it definitely is!! Your card is beautiful, I love the reflections technique. The water color is a perfect technique for that beautiful stamp! Gorgeous card-your coloring is so lovely! Beautiful work Dina! Thanks for sharing! Wow you made this technique look so easy. Thanks for sharing your idea on this stunning card!!! Your card is beautiful! Thanks for sharing!! FIrst time on this blog and I already like the fact that Dina has a new technique to show! Thank you! Love how you did this technique... the card is beautiful! This has to be one of the most beautiful cards I have seen lately. It is truly a work of art that anyone would be delighted to receive. Gorgeous! Wonderful technique on that flower. I love the look of it. Thank you for the inspiration. Good grief! That was amazing to watch!! Fabulous card! Thanks for sharing all the tips and tricks. What a beautiful card! A technieque on wich I think "why didn't I think of that?" Great effect! I've pined it to remind me of using my stencils in this way more often! Such a beautiful card. So need to try this. I have never seen this technique - really amazing effect. Beautiful card - this is definitely going in my to try box! Wow that is a very beautiful card. Your card is amazing and this technique is so cool. Really beautifully done, Dina! Gorgeous work!! Beautiful. Your coloring and shading is stunning and the reflection is so beautiful. I would live to win the prize package so I could try some of these techniques. Can't wait to try this technique. Thanks for sharing!! Wow! This is stunning!! I'm going to have to try! TFS! Thank you for such an informative video on how to combine the various watercolour media - I'd really not understood that the chalk inks could be used in that manner. The result is beautifully real & I love the way that you added just a tiny hint of pale blue for the water line - it seems to have just intensified the colours of the poppy enormously. Wow! Wow! Wow! Every stop on this hop is fantastic...I LOVE your fabulous design and love pretty much every IMAGE in this release from PB!! Thanks so much for a wonderful video and sharing your talent....you ROCK!! Each project in this hop is lovelier than the last--and what fabulous techniques! Can't wait to get some stencils and stamps and start painting. Thanks for sharing your art. Captured my heart and imagination! Love ythe reflection technique - so useful! Too cool! I like the water color look but I am not at all artistic so stamping is perfect. Thanks so much for showing us your talents. Your card is so pretty, thank you so much for sharing it with us. Thank you so much for sharing this technique, I made a very beautiful card! So cool to mirror image in "water"! Love this technique! Wow...just...wow! So beautiful! I am going to save the video and I think I will grab my supplies. Maybe i can stop and start the video and try to "Create alongside" you with the video as my guide. Thanks so much. Gorgeous card. I love this technique and hope mine turns out as beautiful as yours. TFS! Beautiful card and stamps! Great give away! Thank you so much. Once again you created a beautiful card. I have long been a Penny Black fan. Love the new images! Just love this card. I think I will have to rewatch, and have all my supplies ready. Maybe I can follow along and learn the technique! Thank you for sharing this project. It was very inspirational and I look forward to seeing what others have come up with using the PB stencils. Wonderful card, love that we can do reflections with one less step and more accurate placement. What a stunning effect you get from that unique technique! Thank you for the clear and complete explanations you gave as you created it. This is one technique that I do want to try! thank you! This is beautiful! Love your colors! Thanks for sharing!! Beautiful card! I am a big fan of any watercolor effects. Thanks for sharing. Beautiful and a work of art! I love that the stamps and stencils match! Thanks for the inspiration. I really enjoyed you video makes me want to break out colored pencils and paints thanks for the tuturiol! Love the technique you used. Your card is beautiful. Love the stamp set and stencil. I'm going to give this a try for sure. lovely card! thanks for sharing your talent -! ooohhh, gorgeous card and beautiful technique. Thanks for sharing. I love the look of this flower with the chalk colors, there are so many different ways to use these beautiful stamps and stencils that I had never thought of. Thank you for sharing your beautiful work. Amazing!!!!!!!!! Never thought to do a reflective technique! Will have to try this!! Truly lovely! I need to try this technique, it's really stunning! Wow!! this card is GORGEOUS!!! I love the technique!! Beautiful!!! Love, love the technique.Thanks for sharing. What a gorgeous card. I love your technique. Lovely card. As a retired math teacher I can appreciate the math involved in mirror images. LOL. Brilliant. Such an elegant yet accessible technique. I'll try for sure. You always show me something I want to try, and I enjoy the versatility of your talent. Today it is reflection. Brilliant. Such an elegant yet accessible technique. I'll be trying it. I love the font in this stamp set. Your reflection is also pretty cool! Wow you make it look so easy, I've never done very well with techniques involving watercolour pencils, but you've inspired me to have another go. Wow what a beautiful card and wonderful technique. Love this effect. I have some of these inks and didn't know I could blend them with water. Thanks for the education! Well done. What a great way to use the stencil. Such wonderful talent and great inspiration! Love this technique! What a unique technique, Dini! I love how the stamping looks like pencil lines under watercolour and the way you did the reflection in the water is amazing! Oh my goodness, Dina, this card is gorgeous! I love the reverse image technique--it is absolutely beautiful! This is so lovely - I can't wait to try the technique! Thanks so much. This is amazing! Great technique!!! Gorgeous card, love the water reflection technique. Lovely technique. I can't wait to try it out myself! Thanks so much. Beautiful! I so need to try this technique, thank you for the inspiration Dana. Beautiful card! Love the technique. Thanks for sharing. Absolutely gorgeous! Can't wait to give this technique a try. Beautiful! The water reflection is just so calming and elegant! I am almost on a dead run to my artroom to get those pencils out and start coloring! Your artwork is sooo inspiring and beautiful. Thank you for making this tutorial and for showing us it is possible to make some really beautiful projects. WOW!! I never would have thought of doing this! Oh, I loved this technique! The card is beautiful! Very beautiful card. I wish I had your talent. Thanks for sharing. Beautiful card!! I love the big stamps! Thanks for the chance to win the giveaway!! beautiful card. thanks for a chance to win! Wow! You are such an amazing artist. Gorgeous! Love this watercolor technique. Thanks for a great video hop. Such a beautiful and elegant card. I really appreciate the tutorial video. There is SO MUCH here that I would never think of on my own. Thanks bunches for the inspiration! Dina, your card is spectacular. Thank you so much for showing your process. It's really helpful. So pretty! Something completely different from what I've seen so far, but it's gorgeous! Thank you for your video tutorial. This way of creating a reflected image is new to me. I look forward to trying it out. Ow my gosh I'm in love with this look!!! I have to try this!! Oh Dina, water coloring is my favorite medium, love how you created that reflection on the water with this gorgeous flower. Your video is fantastic, thank you for sharing and for the chance to win. Very pretty! I learned something new today! Beautiful. I love the look using watercolour paper gives. A stunning card! You make the flower look like it is real!! Love this technique! Hi Dina!! I LOVED, LOVED, LOVED.... this tutorial. LOL I am itching to do some "real" water coloring. I'm surprised at the white acrylic paint, rather than a blue. But I totally got that it was a reflection in water, when I saw this project. This is the neat thing about viewing and sharing each other's art, we all do it differently. And I never thought of using WC pencils, but not blending them, I'm so glad you shared that too. Nor did I know that some chalk inks are water soluble. I learned so much from your tutorial. And LOVE your beautiful results with this beautiful stamp from PB.